The Church of the Assumption is considered by many as one of the most magnificent in the State of Louisiana. Its architecture is beautiful, stately, and grand. The 14 columns are Romanesque with Corinthian capitals. 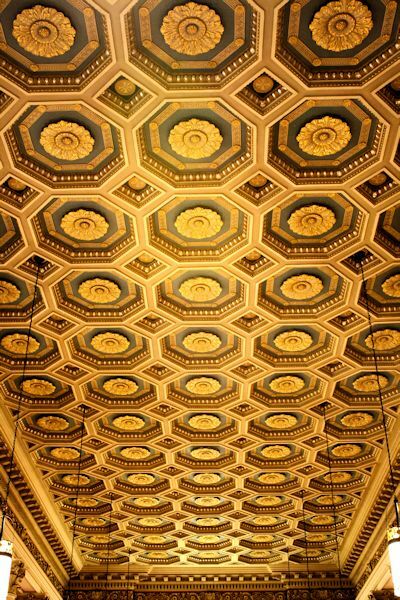 The ceiling is composed of octagonal shaped plaster casts that are suspended by cables from the roof. 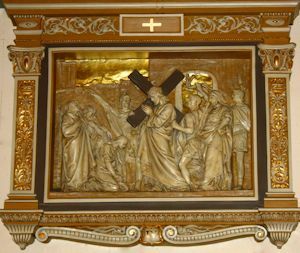 They were originally unpainted until 1958 when Monsignor John H. Disch, who was serving as pastor at that time, added the painting and the gold leaf. This was done by Rudolphe Compte. In the center of each octagon appears a floral relief, highlighted in gold leaf. 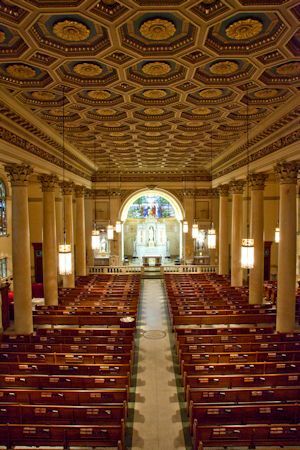 Under the pastorate of Father Michael Russo, the columns were marbleized in the Church's interior renovations in 1999. A pelican appears on the ceiling above the altar. Legend has it that the pelican will prick its breast to feed its babies. 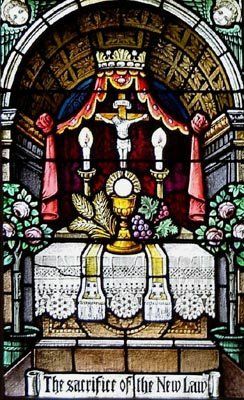 One easily sees the connection to the pierced heart of Jesus, from which flows the sacramental life of the Church. 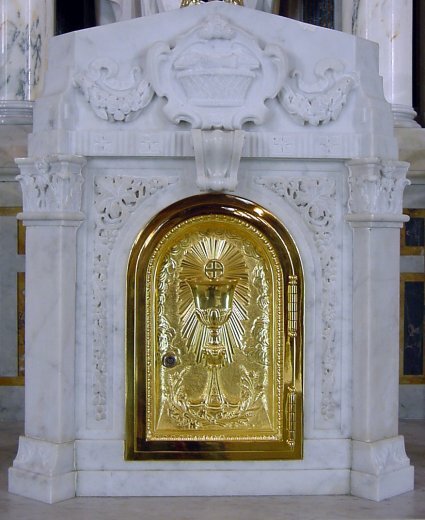 The two marble holy water fonts, which are by the main doors, were donated in 1921 by Mr. and Mrs. James Chauvin. 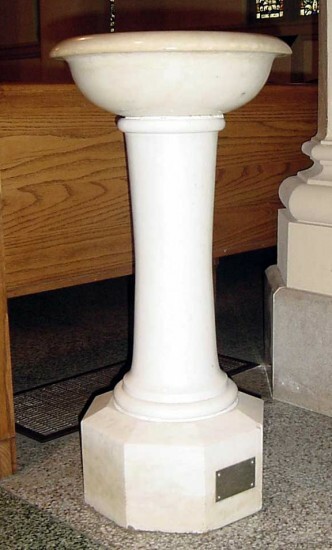 Two additional holy water fonts were added in 1941, and now stand near the side entrances. The Stations of the Cross were erected in 1921 and valued at that time at $2000. They were a gift to the Church by Mrs. Paul Kramer in memory of the Underwood Family. 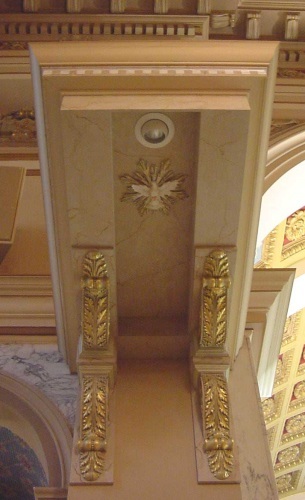 The gold leaf was added to the Stations in 1958 at the same time that the ceiling and other major improvements were made. Cleaning and refurbishing of the Stations were done in the Church renovation project of 1999. 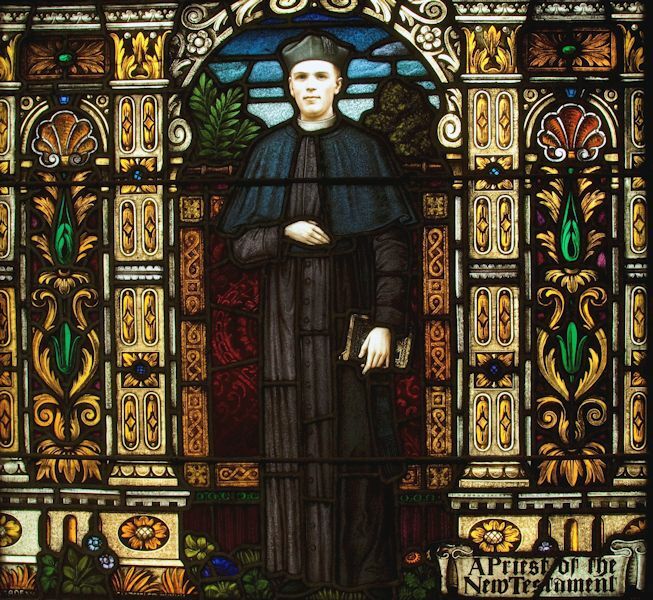 In 1928, the stained glass windows were installed. 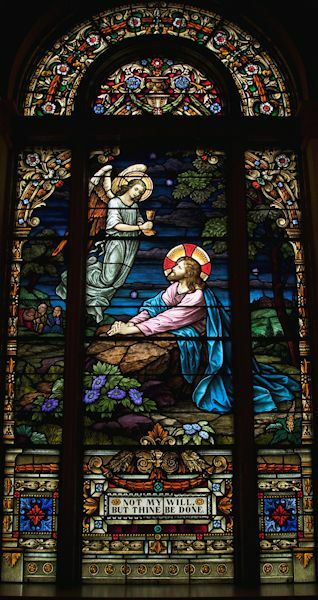 Each window was a gift to the Church from a parishioner or family. Msgr. Rousseau, pastor (1914 - 1953), traveled to Germany to personally select them. These beautiful windows were executed by F.X. Zettler of Munich, Germany, a very prestigious stained glass company, whose windows were second to none. The large windows along the side walls tell the story of the Life of Mary In Stained Glass. In the vestibule of the Church, two windows celebrate a Priest of the Old Testament and a Priest of the New Testament. 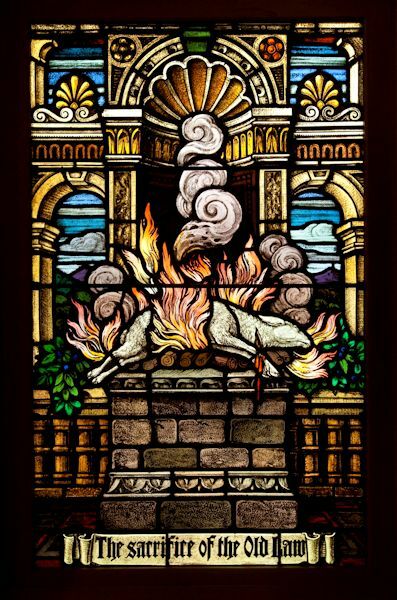 This theme is revisited in two windows near the front of the Church, depicting the Sacrifice of the Old Law and the Sacrifice of the New Law. Throughout the Church, worshipers are inspired and instructed by beautiful biblical scenes captured in stained glass, including this depiction of "The Agony in the Garden." 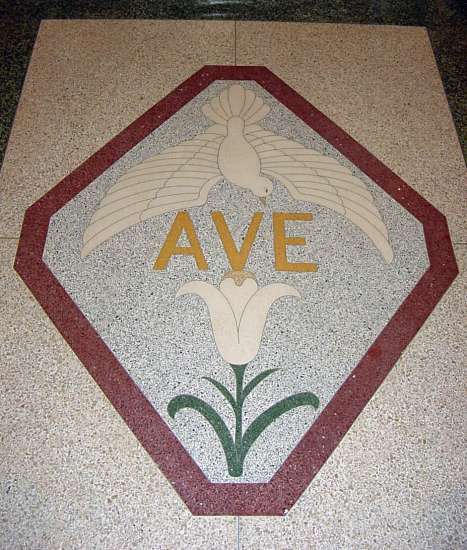 The terrazzo floors were installed in 1958. 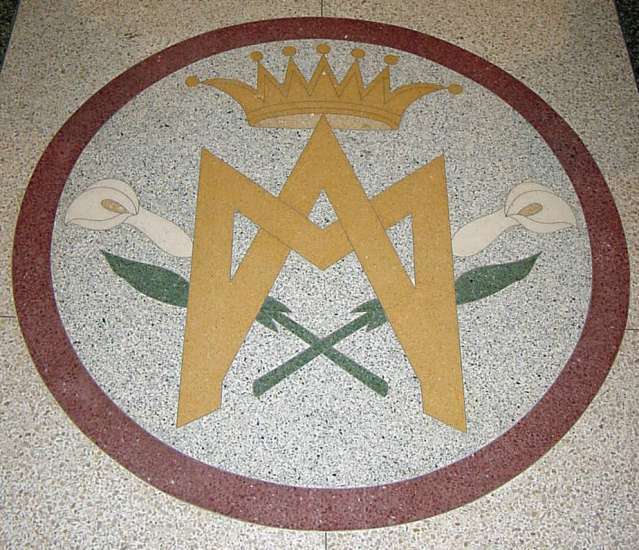 The symbols inserted in the floor were designed by Sr. Cor Mariae Foley, a Marianite Sister who was at St. John Academy at the time. 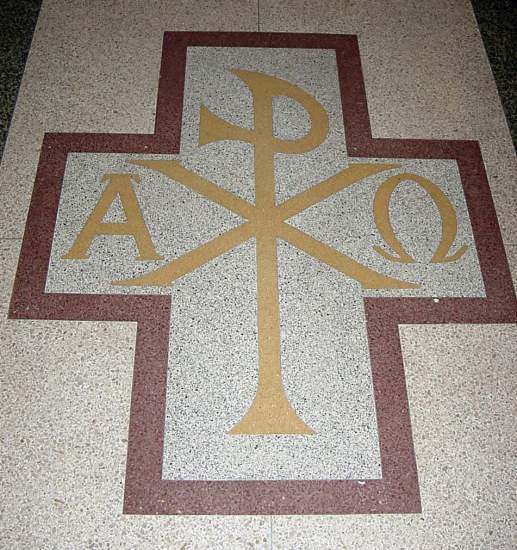 At the entrance of the Church is the symbol,"ChiRho," the first two letters for the name of Christ in Greek, and alpha and omega, the first and last letters of the Greek alphabet. It means, "Christ, the beginning and the end." By the Communion rail, there is the symbol of the Annunciation, with the Dove representing the Holy Spirit. Until 1935, there was no marble in the Sanctuary and the main altar was constructed of wood. In 1935 two beautiful side altars were erected. A Mr. Joseph Burg donated three thousand dollars for the construction of one of the marble side altars, which was made in Italy. 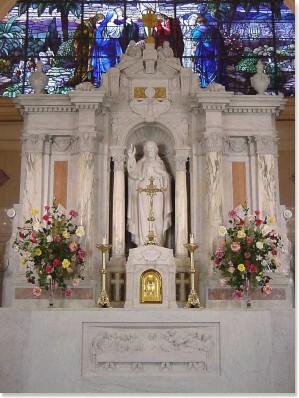 The other side altar, made by the Vermont Dallas Marble Co. of Dallas, Texas in 1934, was donated by Mr. Salvador Caprito. 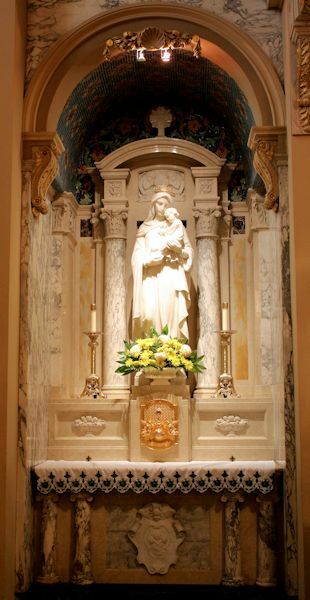 The altar on the left is the Blessed Virgin Mary Altar and the one on the right is the St. Joseph Altar. 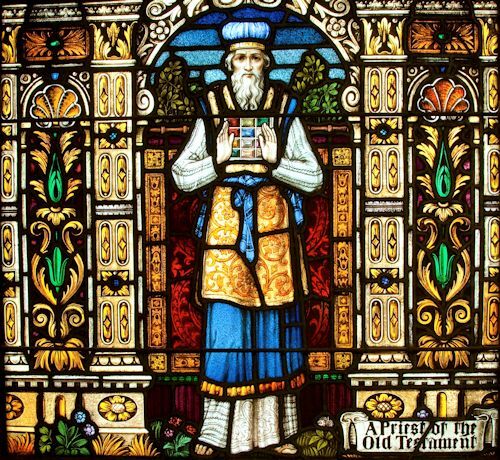 In the 1999 renovations an ambry was installed to house the holy oils on the St. Joseph Altar. Next, the huge main altar, the marble wall panels and the marble communion rail were installed. The altar was designed by New Orleans architects, Bendernagle and Cazale in 1938 and executed in Rome. 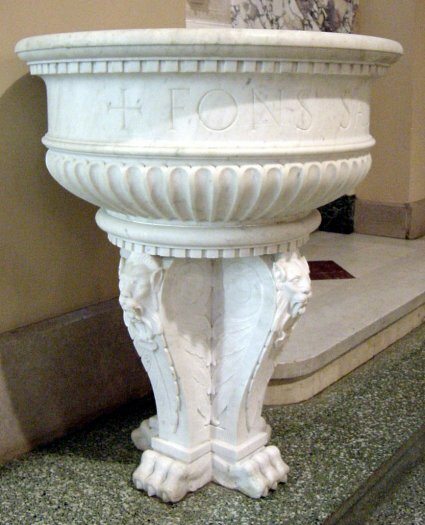 In 1939, the same architects designed the marble baptismal font, which was also constructed in Rome. The cost of the font was $450. The same Greek dentil work appears on the top of the main altar, the edge of the baptismal font, and the ceiling of the Church. The font was originally in the Baptistry to the right at the entrance of the Church. 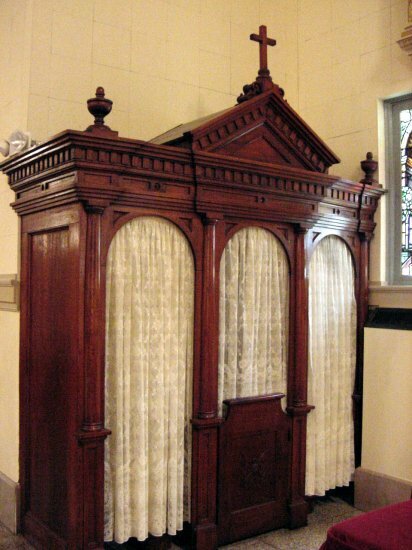 The tabernacle was installed at the same time that the altar was erected - in 1938. 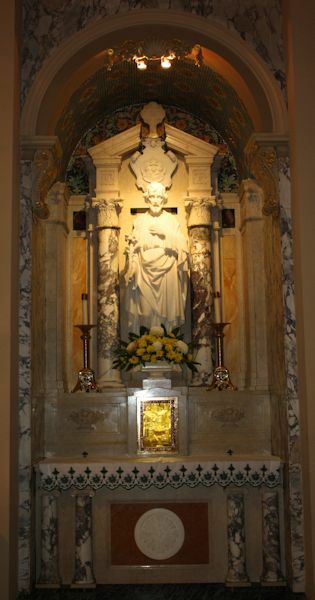 In 1965, after the Vatican II Council, the tabernacle was removed from the high altar and the Blessed Sacrament was reposed in a tabernacle on the altar of St. Joseph. 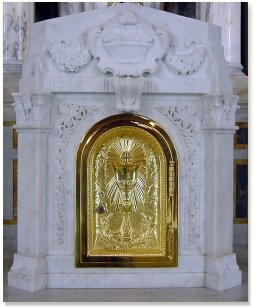 In 1995 both the outside and the inside of the beautiful tabernacle were restored and the 24-karat gold door was re-gilded. The tabernacle was dedicated and placed back on the main high altar where the Blessed Sacrament is now reposed. The confessionals of cypress include elaborate relief design that matches the Greek dentil border on the main altar. They were constructed in 1921 but were stripped and restored to their natural beauty during the renovation of the Church in 1958. 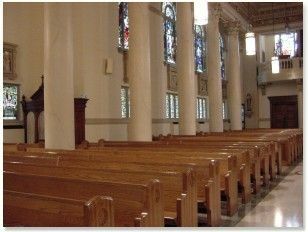 The solid white oak pews were installed in 1958. They were refurbished during the 1999 renovations. During the 1960s, after the Second Vatican Council, the present altar was detached from the high altar. It was cut down in size and moved out, enabling the priest to face the congregation. It was cut down in size and moved out, enabling the priest to face the congregation. The Last Supper in bas-relief is original to the high altar and dates back to 1938. The pulpit was constructed in 1960 during the pastorate of Msgr. Disch. 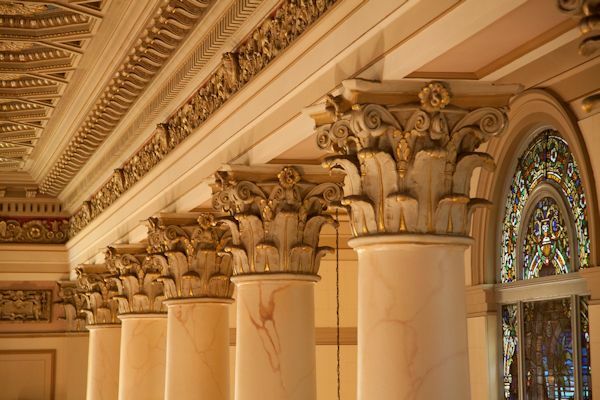 It was designed by Stan Gall and features the same Greek dentil motif that was found throughout the Church. The canopy above the pulpit was added during the 1999 renovations. 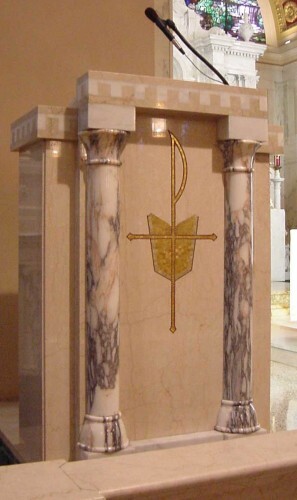 It, too, was constructed by Stan Gall with a design to match the pulpit, including the painting of dentil work above. The pulpit canopy was primarily constructed to allow for more light. The original pipe organ was purchased in 1955 for the price of $15,000. It is a Wicks organ, 2 manual and pedal console, with 19 ranks of pipes. In 1971, the exposed pipes were added to the left of the organ, contributing additional brightness and clarity to the tone of the instrument. 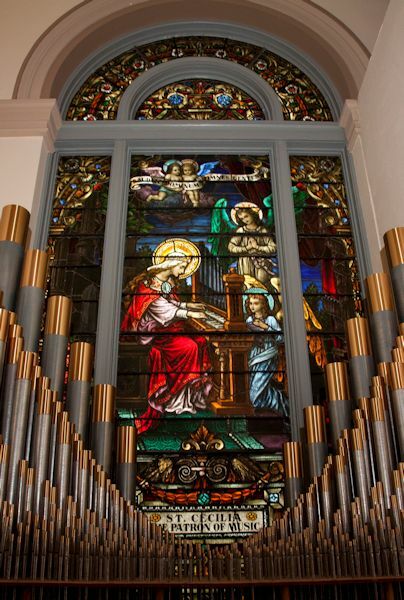 These exposed pipes now frame a stained glass window depicting St. Cecilia, patron saint of musicians. A refurbishing and upgrading of the organ by the Wicks Organ Company took place in 2000.